Our President, Priscilla Davila, has accepted a new position within GE and has moved to Texas. As per our Bylaws, Homero Gonzalez became the new President of the chapter. Cindy Arroyo took over his position as the VP of Corporate Relations. And we would like to welcome a new member of the Board, Oscar D. Cedeño Mendoza, who took over Cindy's position as VP of Operations. Born in Ecuador, he attended the University of Central Florida (UCF) and graduated with a Bachelor in Electrical Engineering. As a student at UCF, he was a very active member of SHPE. Oscar is currently working in Duke Energy as a System Operator Engineering Support. Please join us in various Social Media channels and let's start making a difference in Cincinnati! We have aggressive plans for this year, but we'll need your help! In November 23, 2013, a Robotics team from the Academy of Multilingual Immersion Studies (AMIS) participated in a regional First Lego League Robotics competition. Coached by members of the SHPE Cincinnati chapter and coordinated by Dr. Victor Marrero from GE Aviation, the ”AMIS Spartan Warriors” team did an excellent job by finishing top 4 out of 16 teams, during the robot elimination tournament. It was a great effort by the students and coaches. A special “thank you” goes to Oscar Morataya, Homero Gonzalez, Jose Borrero Vega, Rebecca Schmidt, and teacher Maria Lang for all their help, dedication and effort for the last several months leading toward the tournament. The success of the team could not have happened without their time and talents given to the students. We are very happy to announce that Cindy Arroyo is joining the Executive Board of SHPE Cincinnati as a Vice President of Operations. Cindy was born and raised in Puerto Rico. She later attended the Georgia Institute of Technology, where she received a degree in Mechanical Engineering in 2004. She was an active member of SHPE throughout her collegiate years. Upon graduation, she began working for Toyota Engineering and Manufacturing, NA. She has maintained the roles of a Parts Commodity Engineer within the Purchasing Division, and a Project Manager within the Production Control Division. Her current role serves as an overall Vehicle Quality Engineer within the Quality Division. Outside of daily work functions, Cindy also participates actively in TODOS (the Toyota Organization for the Development of LatinOs) and WLF (Women’s Leadership Forum). Please help us to welcome her to the Board and wish her all the best! 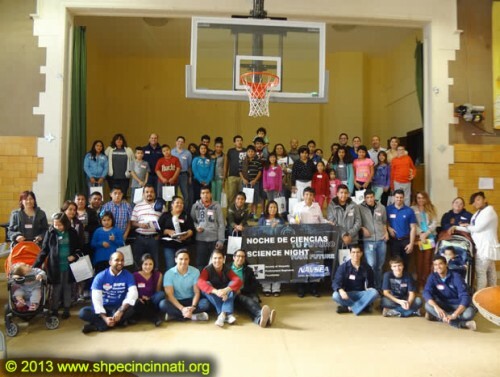 SHPE Dia De Ciencias (Science Day) a Success! Our Dia de Ciencias was a total success! We had many kids and their parents attending the event, and learning about carreer opportunities in STEM area.